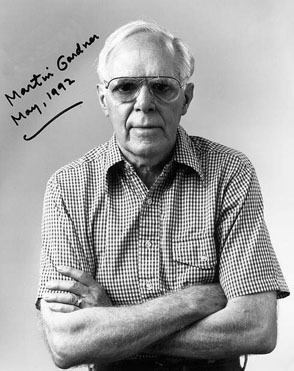 The enormously influential mathematics and science writer, skeptic, and encourager of many, Martin Gardner, has died at the age of 95. I came to know Gardner through a mutual friend, the late science writer and skeptic Bob Schadewald (1943-2000), who occasionally visited Gardner at the latter’s home in North Carolina. [Here’s a tiny but relevant fact that shows the surprising reticulations of the science-and-theology debate in America. During one such visit, Gardner gave Schadewald much of the contents of his library, which he found had grown unwieldy. Then, years later, following the devastating fire that destroyed nearly all of YEC paleontologist Kurt Wise’s library, Schadewald packed much of his personal library into boxes to send to Kurt. Schadewald died a few days later, at nearly the same time his books arrived at Kurt’s home in Tennessee. Kurt unpacked the books, carefully wrapped in tissue, in tears, knowing that the person who sent them had just died. So, chances are, at least some of Martin Gardner’s personal library now resides with Kurt Wise. Go figure.] Schadewald told Gardner about this crazy YEC philosophy of science graduate student he knew, at the University of Chicago, and in response, Gardner sent back a letter to me. In his adolescent fantasies he saw himself as chosen by the Lord to lead this new awakening. And to carry out this stupendous undertaking he conceived a brazen plan….He would enter the very citadel of the enemy. He would master all the science and modern learning that a great secular university had to offer. Every false and infernal argument would be examined and exposed. He would probe the diseased heart of twentieth century theology, dissect it nerve by nerve, artery by artery. The passage comes from Gardner’s autobiographical novel, The Flight of Peter Fromm (1973), which Bill Dembski has used as a textbook in seminary courses he’s taught. While Gardner’s fundamentalist Christianity died a long and painful death, his theism never did. See his fascinating and utterly readable The Whys of a Philosophical Scrivener (1983), where Gardner vigorously defends his fideistic conception of God, as well as his belief in the efficacy of prayer, and personal immortality. It’s hard to say where Gardner would have stood in the current New Atheists versus Accomodationists debates. While he loathed woolly-minded, fuzzy and imprecise thinking, suspecting it of concealing (deliberately, perhaps) deep confusions — and such thinking is much on display among many defenders of “theistic evolution” — he also disdained the imperialistic and often inhumane reductionism of scientific materialism. I like to think, if Gardner had been found the strength for another decade, or two, of writing and thinking, he would have drafted a book challenging the New Atheists. Heck, why not. He refused to fit into anyone’s categories. In the mid-1980s, when Gardner asked me about Adam’s navel, I found the question sophomoric, and told him so. Who cares? In what possible scheme of the universe would the existence of a small indentation (or not!) in Adam’s abdomen make the least bit of difference to anything? Now, almost 25 years later, Gardner’s question makes more sense to me, at least as far as its motivation is concerned. Critics of intelligent design start their reasoning with a model of God and His rationality. The world as we find it must fit with that model. For Gardner, a rational Designer faces a dilemma in making the first human being, if He is creating him de novo. Navel or no navel? The former possibility entails the deceptive appearance of history; the latter leaves Adam looking somehow odd, facing awkward questions from the kids. Just the sort of question Gardner delighted in asking. Lord, remember me! If God is the creator and sustainer of the universe, if every wave and particle is what it is, does what it does, because God remembers it, then we exist now because God remembers us. And if God remembers us after we die, we may continue to exist. That is all a theist need say to establish in his or her heart the possibility of immortality. ,,,And that correct interpretation of scripture does indeed allow for a old earth viewpoint, on top of the fact God exists outside of time (shoot, He created time), I feel that much of Gardner’s inner conflict, could have been adverted if he had not felt the Young Earth position so crucial for his belief. And the appearance of age for Adam, in Ross’s and Rana’s OEC scenario, is avoided how? Actually Dr Nelson, if God were to create Adam with the “appearance of age” as you are holding, in the same way that you are holding he did for the the universe, then Adam would have scars, liver spots, worn teeth,, maybe a balding spot,, etc..etc.. The point being is that Adam “appeared brand new” as far as the effects of time are concerned. thus your objection is without relevance to the point being made. I think that the problem is that young-earth creation and divine revelation are intermixed. That is, it is pride and arrogance that says that any answer to any question must be decidable without God’s revelation. It is *only* when you think a question must be decidable without God does it become “deception” when God does something that is only fully interpretable using God’s revelation. In the YEC view, General Revelation is *supplemental* to Special Revelation. In the OEC view, General Revelation is *equivalent* to Special Revelation, and in the TE view, General Revelation has *priority* over Special Revelation. Just to clarify, I don’t think that everyone fits my general categorization (I certainly know OECs and TEs who think that special revelation is superior to general reveltation), but I think that it’s a generally true statement, especially of the main proponents of the theory. The point being is that Adam “appeared brand new” as far as the effects of time are concerned. thus your objection is without relevance to the point being made. Adult structures in Homo sapiens, such as permanent teeth, normally give evidence of growth patterns indicating a temporal sequence from juvenile to adult. It’s not a question of wear and tear, as you argue. If Adam was created de novo as what appeared to be (let’s say) a 25 year old male, his entire body would — to an observer who did not know Adam has just been brought into existence — give the appearance of age. Thus, Ross and Rana do not avoid the problem of the appearance of age. Thanks for the link to the article, very interesting look at scientists combining lab work, field work, and fossil study, with mathematics. I’m not sure why you think it is bad news for evolution, perhaps you could explain that? Dr. Nelson, I have to completely disagree with you by the fact that you yourself indeed hold that God created Adam fully formed. (Did Adam have a belly button Dr. Nelson?) If God had indeed created Adam with wear and tear that could be discerned by a observer upon scrutiny then God would have indeed willingly deceived us when he created Adam, and that is simply unacceptable as a position for a Theist to take for God does not lie nor is He the father of lies. Yet if God had recently created the universe fully formed, brand spanking new, as you hold, we would be able to discern that newness upon scrutiny and would not have to visit such drastic contortions upon our physics nor upon our theology! You objected that Adam would appear old to a casual observer (whoever a casual observer might have been at that time since no other human was around), and that that observer might not thought to have closely inquired where this new human came from, bears no weight to the question if God would willingly deceive us with the “appearance of age”. How does the OEC Adam differ from the YEC Adam? As suckerspawn notes, there’s no observational difference between an OEC Adam and a YEC Adam. More to the point, however, no answer to Gardner’s question would have satisfied him. Adam with an umbilicus? Then God is a deceiver. Adam with no umbilicus? God is STILL a deceiver — which is why I refused to answer his question. The real problem is the naive theology Gardner presupposed. Nota bene: it is impossible to answer Gardner’s question in any verifiable way. That, all by itself, should give one pause. Dr. Nelson, hopefully together we can personally ask Adam in heaven sometime about his belly button and have a good laugh about the fact we were talking about his navel, or lack thereof, in the first place. It’s been shown that light can be slowed through different mediums. Is it possible that light can be made somehow to move faster? If so what implications would that have? In other words if light can be shown to be capable of having its speed altered does that mean anything for the assumptions that are made based on that speed? Adam would only have the appearance of age if you view him as an individual. If rather you viewed the creation of Adam as the creation of humanity, then humanity is a life cycle. It’s a circle, and an adult human male is a just a point on the circle and does not automatically imply “age” at all. Of course, if you were looking at it from God’s timeless perspective, “age” doesn’t exist at all. Adam with an umbilicus? Then God is a deceiver. Adam with no umbilicus? God is STILL a deceiver — which is why I refused to answer his question. What I was saying before is that it’s a “chicken and egg” question. If you view the egg as being first, then the appearance of a chicken would to you be the appearance of age. But if you viewed it the opposite way, that the chicken comes first, then the appearance of the chicken would to you be the logical beginning and no “appearance of age”. If you were God, which would you perceive as coming first, the chicken or the egg? Hint: God has never been an egg, and he came first. It’s really just a matter of perspective. I like to think, if Gardner had been found the strength for another decade, or two, of writing and thinking, he would have drafted a book challenging the New Atheists. Gardner apparently chose to reprint “Why I am not an Atheist” from The Whys of a Philosophical Scrivener in his final book as his response to the New Atheism. It does have to be said that fideism like Gardner’s, rejecting both empirical and metaphysical arguments for God or religion, is one of the challenges that the New Atheists find easiest to dismiss. I find the suggestion “then God deceived us” when used to support ANY position sophomoric and irreverent. David Menton notes that the umbilicus entails much more anatomy than the superficial outward appearance. Kurt Wise has suggested looking to the miracles of Jesus. When he created wine — were the grapes ever stomped? If a scientist were to sample the wine, what would his tests tell him about the wine’s age? When he multiplied fish — were all the pieces part of an actual fish that swam somewhere? Everyone serves good wine first, and then when people have drunk freely, an inferior one; but you have kept the good wine until now. Thus the wine was without blemish. which is exactly my point with Adam. Shoot I would hold that the wine was the best wine to ever touch the face of earth (My apologies to Mogan David 20/20 and Nighttrain) Whereas I look to the earth and the evidence for an ancient age is simply overwhelming (erosion, ancient meteor impacts etc..etc..), and my expectation of perfection and truthfulness from God is just far too great to be swayed by what I consider very unbalanced YEC arguments, especially when the arguments trespass into physics and demand contortions of universal constants. Seeing as Stephen Meyer himself has probably had long discussions with Dr. Nelson on this very topic, I should have known much better than to try to persuade Dr. Nelson otherwise. Be that as it may, we can at take deep satisfaction in the fact that we share a common salvation in Christ which is by far the most important fact of all to be sure about. How old were the pieces of fish? In Creation and Time, Hugh Ross cites the miracle at Cana as part of his argument. True enough, taste does not determine the age of a wine, but that misses the point. By definition, wine is the result of an aging process. This fact was not lost on the disciples (see v. 11), but it seems to be lost on Ross and ba77. bevets a better question as to a useful apologetic tool would be to ask, What is required, operating within known laws of physics and principles of quantum mechanics, for Jesus to multiply fish? and riddick you suddenly have enough faith for a young earth position? Man I am so glad to hear you finally converted to christianity!!! The umbilicus is not an organ. It is the remnant of the placenta, the organ we all lose at birth, so cunningly devised that the cord falls out after some days, leaving only a winding pit (usually). If I were to design a man or woman from scratch, I would put one in – not to deceive anyone, but simply so they would look like other folk, for their own good. That is, I would never deny that I had designed them from scratch, and would in fact affirm it. But I would insist that they look like other people. Otherwise, they would stand out in the shower room crowd, and frankly, that would be a problem. In the same way, Eve is usually portrayed as having long hair. She would not have had time to grow it. But if it is a cultural feature, as it is in many societies, I would just install it, to prevent any suspicions about Eve’s character. Now, I do not necessarily subscribe to the anthropology outlined above. How humans came to be human is as much of a mystery as ever, one on which Darwinism has shed darkness, rather than light, in my view. But the “deceit” thing strikes me as nonsense. If God said he was going to make a man and a woman from scratch, I assume he would make persons of adult years who look like the pattern of their species. That would include navels (and long hair), even if the navels were not the outcome of birth and the long hair was not the outcome of many months of patient cultivation. If I were the designer I would cunningly devise it so nobody would need to have a navel. The fact that he didn’t doesn’t speak well of his capabilities. A human designer would have thought of that and found a solution. All it takes is a just a few base pairs; there are plenty of spares in the genome. Cabal, I am amazed at the atheists capability to readily assume he can design a human body better than God. Have you ever designed a single novel protein in your garage and inserted it into life? Has anyone ever done so anywhere? Thus cabal since not even one novel functional protein has been generated by man should you not take a bit more humble approach in your grand claims of being a better designer than God? And frankly I’m fed up with evolutionists telling our kids how terribly made and worthless they are. Maybe you guys could learn something from this guy cabal. It will make or break a company.a home. a relationship. “If I were the designer . . . ” only means that you are not the designer in question. It says nothing about the credibility of inferring from inductively credible signs of design, to presence of design as best explanation. Also, unless you are in a position to know the constraints and to know the purposes, you are in no position to judge the quality of the design. Have you created a reproducing humanoid who does not need a navel, for whatever purpose? In short what you have argued boils down to finding an excuse to object rather than dealing with substantial issues on the merits. PS: On the behalf of the creationists, the appearance of age is not evidence of deceit on the part of the Creator, especially if there is a context in which there is a testimony from said creator to the true origin. So, wisdom is to allow all the evidence we may observe to have a voice, including that of empirically reliable signs of intelligence. Further wisdom is to hold our reconstructions of a remote, unobserved past with a due measure of humility, not pretending to a degree of warrant or even certainty that on principles of empirical reasoning, we cannot properly claim. If I were the designer I would cunningly devise it so nobody would need to have a navel. The fact that he didn’t doesn’t speak well of his capabilities. The fact that you haven’t designed a human yet, nevertheless criticise someone who had because of a superficial feature, doesn’t speak well of you either. A human designer would have thought of that and found a solution. All it takes is a just a few base pairs; there are plenty of spares in the genom. I think there is a job for you at the J Craig Venter Institute. You just think of everything and can sort all issues using just a few base pairs. When you present your latest improvements on living creatures do give us an invitation to the press conference. I agree with O’Leary, the “appearance of age = deceit” idea is a load of baloney. People are only deceived by appearance of age if they choose to disbelieve what God explicitly said about his creation of Adam, and rely solely on their own insight. If God said, “Then the LORD God formed man of dust from the ground, and breathed into his nostrils the breath of life; and man became a living being,” and people look at man and don’t believe it, how can they accuse God of being deceptive? God even warned against the self-deception (darkening of heart) that would occur for those who refuse to give him due credit — Romans 1:21-23. It would be like Craig Venter publishing about his insertion of a synthetically-copied genome into a living cell. He has broadcast a public message about how it was created. His paper even details how the descendants of the tinkered cell appear normal, that is, they resemble completely-natural cells in most important respects. Why should God pander to people who won’t believe what he says? They make a rule that what God says is inadmissible, then complain that what’s left is misleading. Reminds me again of the dwarfs at the end of The Last Battle. O would you want someone working on you who thought the human body was actually a cobbled together piece of junk???? If I were the designer I would cunningly devise it so nobody would need to have a navel. The fact that he didn’t doesn’t speak well of his capabilities. Given that I freely claim the designer is God, do you understand the futility of an argument that suggests you have understanding that God does not? But that is precisely what ID proponents suggest, that they know God well enough that they know he did not use random mutation and natural selection to generate the body plans that we see today. A question I often ask is, why is not “possible” for God to have done something that it is difficult for us to understand? It would be funny if it were not so sad . . .
ID proponents do not claim to know anything about the designer. They are starting with the object and suggesting the object exhibits traits of a design. I am a YEC. I start with the Word of God which tells me that God (designed and) created all of life. As for possibilities: It is possible that John McCain could have been elected in 2008. He was not. Did the Creator create with the appearance of age? But if God created Adam whole cloth then it would not be deception because he also spoke to them (Gen 1:28): “And God blessed them, and God said unto them…” And as the Targum elaborates at Gen 2:7 (“and man became a living soul”): wahawat b?’adam l?ruach m?mall?la ‘and there was in him a spirit of speech’. This “problem of the appearance of age” is pseudo-problem, it’s an artifact of a certain wooden literalism … you know, similar to the sort “oldies” are always accusing “youngies” of poessessing. Odd, isn’t it? Cymatics is the study of wave phenomena. It is typically associated with the physical patterns produced through the interaction of sound waves in a medium. Myself, I always wonder whether the old earthers (whether they’re creationists or atheists) are taking relativity into account when they point to the light from stars millions or billions of light-years distant as “proof positive” that the universe *must* be vast ages old. Yes, they do take relativity into account. No. For purposes of determining the age of the universe, astronomers use a frame of reference from which the cosmic microwave background (CMB) appears equally red-shifted in all directions. Earth is in a different frame of reference which is moving at 370 km/s relative to the CMB. Relativity merely says that the laws of physics remain unchanged in different reference frames. In that sense there are no privileged frames of reference, but that doesn’t mean that they can’t be “privileged” by other criteria. For example, the laws of physics are the same for the sun as they are for all of the planets; nevertheless, the sun clearly occupies a privileged frame of reference geometrically in our solar system. kairosfocus commented above that it would be funny if it wasn’t so sad. I agree with the sentiment here, assuming he/she is thinking the same that I am on this front, and not something different! Cabal gets taken to task above, but really Cabal’s commentary is just the flip side of the literal Creationist take on the story of Adam and Eve. Sigh – anybody out there heard of allegory, symbolism, metaphor? I trawled through the comments waiting for somebody, anybody to point out the obvious, but unless I missed it no. Martin Gardner’s query on Adam’s navel is thus a silly straw man question, but to literal Creationists, it can’t be because they take metaphors and allegories literally, so they bend themselves like pretzels putting round literal pegs in symbolic/metaphoric square holes. You know those stories in those wonderful Greek myths, Greek heroes like Theseus battling the minotaur in the labyrinth, Perseus battling and slaying the gorgon Medusa, Bellerophon slaying the Chimera with its lion’s head, goat’s body, serpent’s tail, the heroic tasks of Heracles, the centaurs, the numerous otherwordly creatures etc etc – well imagine if atheists were to ask how could there have been a creature that was half bull and half man, it’s an impossible hybrid, how could the Chimera have had the head of a lion and the body of a goat and breathed fire, and there is no evidence of centaurs and sirens in the fossil record, that this was all impossible given what we know of the genotypes of lions and goats and none of them are physiologically capable of breathing fire and it’s impossible for a bull and human to um have offspring, for obvious reasons without getting into their respective genomic differences blabla. And then the Creatonists here responded, wait, maybe God or some divine agent, created the Minotaur de novo and the Chimera as well, to test the Greek heroes. We haven’t found their skeletons because they were one-offs and it would be like finding a needle in a haystack and maybe their bodies and bones were destroyed and consumed anyway given they were killed by our heroes and blabla. Of course Creationists defending and often enough atheists responding to literal argumentation for allegory and symbolism re Adam and Eve think this symbolism doesn’t apply to Genesis, or that the Greek myths are silly tales for children, what symbolism? The story of Theseus and the Minotaur for one alone is a very profound SYMBOLIC myth as is the story of Achilles and his one point of mortality, his heel and the nature of his death at the hands of the Trojan prince Paris – to give just two examples. Just two. And of course this symbolism doesn’t just apply to Greek (and Jewish) myth. And when I say myth I do not mean it in a pejorative sense, as in false (ie somebody else’s religion rather than your own) I mean it in its proper meaning, the way Joseph Campbell meant it. Tell me, what about the talking snake, do you Creatonists really think that the Tree of Life (there are actually two Genesis myths on this front but beyond the scope of my post), the tree of knowledge is a LITERAL tree and that we are talking about a LITERAL apple or fruit? And that God literally created Eve from Adam’s rib? PLEASE PLEASE I beg you – don’t answer this question (I know how you answer it already of course), I am trying to make a point that will not be appreciated I fear by too many. On the story of Eve’s creation from Adam’s rib, this is where a fair bit is lost in translation ie to English, French, and before that Latin and Greek, but it’s a long story to explain what I mean, hardly common knowledge. It’s a Hebrew myth, althoug it is actually pre-Hebraic in many of it’s aspects (Sumerian), the roots of Genesis are lost in the midst of time. Hebrew helps, in fact its indispensable. You want to talk lost in translation? Then taking the story of Cain and Abel literally is not possible (well it’s fine if you want to continue to contort yourselves like teenage Romanian gymnasts – see that’s called simile), its symbolic meaning is profound, albeit crudely expressed in parts. The Tree of Knowledge is no more literal than the Nordic Yggdrasil tree, the snake that tempts Eve is no more literal than the Gryphon, the centaurs, the Medusa and the minotaur. Adam and Eve and Cain and Abel are ARCHETYPAL characters, like Perseus and Heracles and Achilles. You know one of the things that sets man apart (at least in theory) from even the most advanced mammals like dolphins and whales and chimpanzees and apes is rich symbolic thought and conception, the ability to deal with sophisticated abstractions, story telling, and the sophisticated language associated with this (along with poetry and song and art and creative endevours in general), it’s actually a big problem to explain in terms of orthodox Darwinian thinking. As I point out above, Creationists don’t consider this little something called SYMBOLISM in the chapter of the Bible where it is MOST applicable (ie the pre-historic creation beginning part – Genesis), they pay no attention to other myths, when not entirely misunderstanding Jewish myths, because they think Greek, Celtic and Native Indian and world myths in general have nothing to teach them, because they are just tales no different to whatever is being sold in the discounted bins at Barnes and Noble (and there are psychological reasons why this is but that’s a whole Pandora’s box…). Or else they think, well those myths can’t be true because they make no sense literally. How could Heracles have battled an impossible monster like the hydra (profound symbolism here) and Perseus have battled a bull-man that couldn’t have existed literally etc? And then without batting an eye these selfsame people interpret obviously equally symbolic Biblical myths literally, but it’s different with the Bible of course is what Creationists tell us! Talk about boxed thinking and irony. Religious myths are either seen as must-be-literal or the flip side false (as many atheists see things), irony is lost on both Creatonists and atheists that there ‘thinking’ here is so alike and two sides of the same coin. Ah Jesus spoke in parables, but never mind, apparently it doesn’t apply to the Old Testament (more properly the Tanach) – even though symbolism and allegory and parable is universal in world religions. In fact it is fundamental, and inevitably and necessarily so. There are actually very pertinent reasons why Creationists take the story of Adam and Eve literally. In a fundamental sense they have to, by the very fact that they are Young Earth Creationists for the most part (or so it appears)! That is by the very fact that they are YECers, it follows consistently, ie the literal reading of the Seven Days of Creation would a fortiori lead to a literal interpretation of the very next myth in Genesis, that of human creation. So at least Creationists are consistent here, actually on this front it is psychologically inevitable. This consistency (of a literal reading of a symbolic myth) continues naturally when it comes to the New Testament’s considerable symbolism. God forbid somebody point out the obvious. Sigh. All this on a thread supposedly about Martin Gardner’s passing! Just a minor but important correction, Gardner’s query on Adam’s navel, is not “silly” as I wrote, since Gardner is making a valid point. It’s only silly if one takes a totally literal or the flip side atheistic it’s-all-silly-made-up stuff approach (which Gardner being a theist did not) and then to respond to Gardner’s query literally. This is like arguing about whether the fruit on the Tree in the Garden of Eden was an apple or maybe it was a fig or a date even, and this kind of argumentation actually proves the point Gardner was making. Such a question on Adam’s navel can only be seen as a straw man question if one is not a Biblical literalist of course. The Bible “literally” does not tell us whether or not Adam had a navel. It is fun to speculate, but to state anything with surety is to go beyond that which is written. Did the New Testament writers consider Adam, Eve, Cain and Abel historical figures? We aren’t supposed to be able to say anything, scientifically speaking, about God. Whatever we claim to know about God may be true or false, considered theologically or philosophically, but that knowledge isn’t the stuff of scientific explanation. — is my presentation of the standard argument for methodological naturalism (MN). But MN does not represent my own understanding of the optimal science / theology interaction. The quote, however, makes it seems that MY view is being presented. In the original complete context, I’m presenting MN arguendo. YECs don’t ignore the symbolism in Genesis, but believe that it results from God acting in ways that are both true and poetic. This is also the way that the early Christians and Jews thought of scripture. Early Jewish thought clearly put Genesis – including the early parts – as historical. See, for instance, Josephus’ work, the Genesis Rabba, and others. In addition, as many commentators have pointed out, there is not a break in the story between Genesis 11 and the rest of the book. Divine intervention slows down and starts occuring from afar off, but, at least as far as the text of Genesis is concerned, that is simply part of what happened. I graduated from a progressive seminary that believes what you do. The problem is that it is difficult to say that Genesis is obviously just allegory when the early commentators were overwhelmingly convinced of its historicity. To say that modern scholarship has found the *original* meaning of the text would mean that the *original* meaning wasn’t understood by the culture and language that created it, and, magically, the modern era, in a completely different time, culture, language, and literature, was able to discover what was *really* meant by the Biblical authors. It’s also amusing that they always say that the original culture would have understood it in the same way that they do, but the historical evidence is against them. As I said, no one has denied the symbolic meanings. But instead of being the result of human creative history-making, YECs believe it to be primarily the result of God’s divine plan. As to the “two stories” of Genesis, the “difference in time order” that is usually used to separate out these accounts is based on an overly-specific reading of Hebrew tenses. Hebrew doesn’t properly have tense (though it has many indicators of tense). There are many places in scripture where the expected tense from the indicators doesn’t match with the narrative. These are always simply redefined with the proper tense. The exception is Genesis, where the original tense is kept against what the narrative would say. The fact is, Hebrew isn’t specific enough tense-wise to make the case. My Post 31 was responding to Cabal @ 25 who was advocating MN. Sometimes the debate about exegesis of Genesis ignores larger problems that would have to be resolved if certain views are taken. 1. The whole redemption story that is central to the Bible is built on the understanding that death, disease, and struggle were a punishment for sin that required a redeemer. To understand all of these as part of the original design, and as the vehicle for how species got here, does radical damage to a biblical view of God and His character. If death is natural, needed, and good, why would Jesus try to interfere with this process? 2. When evolution is understood as the vehicle that God used to create after the basic elements were put into place, there is no explanation for how humans came to be unique, and created in God’s image apart from all other creatures, which includes having a soul. Was there an exact moment in evolutionary descent when God considered apes to have advanced enough that he sent down a soul? The question sounds silly, but there is reasonable explanation if we feel that the Bible has to be squared with a materialistic view of origins. In response to bevets’s point at #46 (not directly above). The point you make that the days of Creation in Genesis cannot be interpreted as eons or epochs of any kind, that this modern Bilblical apologetics fails, I agree with you. I don’t care for that kind of thinking either, it’s apologetics and it doesn’t wash with me either. You misunderstood the point I was making when I speak of the symbolism of the Genesis Creation myth, so your above criticism (#46) is a straw-man. I didn’t clarify my point here, namely I do not care for the intepretation that the days of Genesis equall epochs (so bevets couldn’t be expected to know) but my post was overlong as it was and I can’t write a book here. Symbolism/allegory doesn’t mean interpreting the days of Genesis as epochs/eons, I never said or even implied that it did. However this is a common mistake made by both Jewish and Christian theologians and their adherents. Interpreting it symbolically means interpreting it SYMBOLICALLY, having nothing to do with a literal time period, whether that time period is 24 hour days or each day being seen as a a hundred million years or whatever. The latter more modern interpretation is still interpreting the Genesis myth too literally, it is a semi-literal (not completely literal of course) reading of Genesis – just from the other end of the timescale. This is why I think Gerald Schroeder is mistaken with his attempt to reconcile modern Big Bang theory and the age of the universe, relativity of time, ‘quark confinement’ with the Six Days of Creation. Schroeder’s writings here are certainly ingenious and clever, and I recommend reading him in this regard, but I still think it mistaken because it is based on a still too literal rendering of Genesis. Seeing the days of Genesis symbolically means just that, nothing more nor less – not as any measurable time periods whatsoever, not as 24 hour days, not as a hundred million years, or any rough measure in that regard, not a Jupiterian day, not time as measured in terms of any relativistic effects, not time (in this sense) as we commonly understand it, or perhaps misunderstand it. There is in fact a Jewish tradition that sees the ‘day’ in Genesis Creation exactly this way, symbolically. It is both an ancient tradition that has been added to over the historical eras, and it is a very highly revered tradition, coming as it does from the most learned rabbis and Jewish theologians (just like the Church there are different schools of thought here). The thing is that literal thinking about Genesis runs so deep, that the so-called non-literal belief that the days are epochs is largely not remarked upon, since largely not recognised, as still being a too literal interpretation! and not a symbolic one. In other words, this modern ‘progressive’ view of the Genesis Creation is not a radical symbolic notion at all (even though it is mistaken for one), but an updating/revamping of the Genesis myth to the modern age to make its literal rendering more believable/digestible! That is all. The symbolic meaning is still missed. Wasn’t it Newton who remarked that God is a mathematician, so it would seem. So if God made Adam to appear to be in his 30s let’s say, yet chronilogically is brand new, then couldn’t God also create a universe that appears to be 13.7 billion years old yet is also brand new?? Are you sure about that? I can’t get the math to come out, but it’s early in the morning and I may have made a mistake. I did notice that in the sixth colored block from the top, the website clearly states that Biblical PI = 3.1416E16 which is off by about 314 quadrillion. The tenth colored block says that Biblical e = 2.718E40 which is off by about 27 billion quadrillion quadrillion. Both these numbers are in “standard form format”, whatever he means by that. The eleventh colored block then says that the Biblical value of PI is actually just 3.141554508…, and the Biblical value of e is 2.718312812… and that these add up to 5.859867320… and that this is only 0.000007 off from the true sum of PI and e.
Are you sure that the author didn’t just hunt around in the Bible for sequences that produced numbers that were close to PI and e and this was just the best that he could find? Seeing as it is Genesis 1:1 and John 1:1 that produce the results I would say the only one hunting around for “the best he could find” would be you. This is really silly: The author uses an ad-hoc method to derive a very big number of which the leading six digits are the leading six digits of π when expressed in decimal notation. Shouldn’t the Bible use base 60? Or even better, a representation independent of a base? I’m sure that I can use similar methods to derive the value of π from the works of JRR Tolkien. not only does the author of this piece rely on decimal fractions – which didn’t arrive in Europe before 800 A.D., he uses the versification of the Bible, too: an human invention of the 7th-11th century (Old Testament) resp. 16th century (New Testament). This would have been a field day for M. Gardner! Concluding Statement: Now it should also be perfectly clear what the parable of the fig tree in the Olivet Discourse means (Matt 24:32-34). As the disciples were walking into the city on Tuesday morning after Palm Sunday, they noticed that the tree which Jesus had cursed the day before had withered and dried up. Later, on Tuesday evening, when the memory of the withered fig tree was still fresh in their minds, Jesus spoke the parable in question. He said that when the church sees the fig tree leafing out again, it will know that “it is . . . at the doors.” The Greek for “it is” can also be translated “he is.” In prophecy, “door” is often a symbol for the passageway between heaven and earth (Rev. 4:1). What the parable means, therefore, is that when the nation of Israel revives after its coming disintegration and death in A.D. 70, the return of Christ will be imminent. 1. To find this kind of numerology in a thread which is a tribute to the memory of Martin Gardner is highly ironic. 2. Do you have any idea why π was encoded in a way that it was impossible to find it before 800 A.D.? Wasn’t Europe ripe to handle this approximation? 3. You have no basis in your objection. Oh yes, I have. It’s 10. I can’t understand what the issue is if we say God created Adam as a mature human being. Perhaps God formed Adam at an optimum age, say 25 to 30. Then again our perception of age and optimum physical and intellectual development may be a bit off because this would have been before the fall of man. ba77 @ 57: There are two general ways of manufacturing information from an innocent text. One way is to run a pseudo-randomizing function against a large amount of text. The Bible Code does this with its equidistant letter sequence function, which generates a long sequence of pseudo random characters which the searcher can than scan for anything interesting. This is how a list of famous rabbis was found, first in a Hebrew Bible text, then in a Hebrew translation of War and Peace, then in an English translation of War and Peace and finally in the text on cereal boxes. The other way is to worry a short length of text to death. Try as many possible operations on the letters as you can, searching for anything interesting in the resulting pseudo random outputs. If you spot something interesting, publish. If not, use another algorithm. Adding the letters together doesn’t produce anything? Try multiplying them. Still nothing? Take the product of the letters and multiply it by the number of letters. Just keep trying and eventually you’ll hit something. In both cases, it helps to not specify what you’re looking for in advance – just take anything interesting. Your author found PI, but if he’d found the Golden Ratio, I’m sure he would have been just as happy and the results would have been just as impressive. There are hundreds of constants to look for. If you can’t find any, look for saint’s names (famous rabbis has been taken), religious dates, ball scores – eventually you’ll find something. Dembski describes the situation when he talks about archers who shoot at the side of a barn and then paint targets around their arrows, where ever they hit. In this case, shoot the arrow then look around where it landed for any knothole or other interesting mark. If you find one, draw a target around it. If not, fire again. Eventually, you’ll hit something. warehuff, your objection is without merit since it is in fact pi and e which is found within Genesis 1:1 and John 1:1 respectively. If we were talking of the Bible Code, which I am not defending, you may have had some merit, but as it sits I find the only one “worrying a short length of text to death” to be you. Or warehuff, will you again make up any kind of fancy sounding rhetoric that you can in order to deny what is clearly evident? Exactly what is the payoff for you warehuff? Do you have a better deal somewhere than what God is offering you? Please let me know what this great deal is so that I may better understand your sheer insanity. I find it extremely interesting that quantum mechanics tells us that instantaneous quantum wave collapse to its “uncertain” 3-D state is centered on each individual observer in the universe, whereas, 4-D space-time cosmology tells us each 3-D point in the universe is central to the expansion of the universe. Why should the expansion of the universe, or the quantum wave collapse of the entire universe, even care that I exist? From the place of His dwelling He looks on all the inhabitants of the earth; He fashions their hearts individually; He considers all their works. This is obviously a very interesting congruence in science between the very large (relativity) and the very small (quantum mechanics). A congruence they seem to be having a extremely difficult time “unifying” mathematically into a “theory of everything”. (Einstein, Penrose). The Physics Of The Large And Small: What Is the Bridge Between Them? Excerpt: This, (the unification of General Relativity and the laws of Quantum Mechanics), would also have practical advantages in the application of quantum ideas to subjects like biology – in which one does not have the clean distinction between a quantum system and its classical measuring apparatus that our present formalism requires. In my opinion, moreover, this revolution is needed if we are ever to make significant headway towards a genuine scientific understanding of the mysterious but very fundamental phenomena of conscious mentality. Please let me know what this great deal is so that I may better understand your sheer insanity. Moderation is now in effect. Clive Hayden,, and has God failed to provide adequate evidence (Romans 1:20) so that warehuff might be justified in his refusal to be reasonable to any sufficient degree in the course of our debates? Of course not. God has flooded reality with evidence from every angle! So exactly how am I suppose to view his mindset Mr. Hayden? Don’t call other commenters insane. OK Mr Hayden, I’m sorry and I promise I will not call materialists insane anymore. And I am personally apologizing to you warehuff if I offended you with what I said. Thank you, it’s just not conducive to a constructive conversation. 1. There are more than 30,000 verses in the bible. This should be enough to construct any number up to four significant digits, especially as the author of http://www.biblemath.com is only interested in the mantissa. 2. Could you please explain to me why decimal fractions are used? No author prior to the 10th century would have thought of describing π as π ≈ 3 + 1/10 + 4/100 + 1/1000. 3. The author didn’t explain why he uses his particular method: why not adding the values of the letters, and sum the products of the letters in the words? Why multiplying the numbers with the number of letters resp. the number of words instead of taking the average? There are many different ways to works with the letters – how many did he try before getting interesting results? ba77, pi and e are not found in Genesis 1:1 and John 1:1 respectively. Dr. Bluer’s value for pi in Genesis 1:1 is not 3.1416, it is 3.1416 e10+17, or 314,160,000,000,000,000. He “reconciles” the humungus difference between his answer and the true value of pi by “stripping the constants of their surplus zeroes.” But those zeros are not surplus! They are the difference between buying a hamburger at McDonalds and getting a bill for three dollars and fourteen cents and getting a bill for three hundred and fourteen thousand one hundred and sixty million million dollars. His value for e is off by even more. Instead of 2.718, Bluer finds 2.718 e10+40! That raises your two dollar and 72 cent bill to twenty seven thousand one hundred and eighty million million million million million million million dollars plus tax. The values he comes up with aren’t even on the same planet as the real values of pi and e.
Biblical pi clearly equals a circumference of 30 cubits divided by a diameter of 10 cubits, or 3.
,,,,,,,,,,That the universe is also found to be a 4-D “expanding” hypersphere within that circle, and not static as materialists had predicted, a “growth” which seems to keep in line with the fundamental constant “e” used for calculating different rates of growth within “the circle of reality”, should you/we not also be far more charitable in our reading of John 1:1 and presuppose that perhaps we may not have all the pieces of the puzzle yet for why the “extra” zeros are there? It seems to me far more misguided to presuppose that we know everything there is to know so as to say the extra zeros are a definitely a mistake, when in fact we are barely beginning to take “baby steps” to discerning how reality is actually constructed in the first place. I don’t know about you warehuff, but just going from the track record of failed predictions materialists thus far, My money is definitely on the zeros being there for some undiscovered purpose! Without going into the exchange on what pi is etc, a simple reading here will help clarify on the measurement of the vessel in question. Remember it is very reasonable the vessel was lipped. Reading hyperskeptically to find debater’s objection points is not the frame of mind that is likely to cause one to coherently understand. I’m sorry, I don’t understand your comment. Do you think that the findings of http://www.biblemaths.com re the appearance of in Gen 1.1 and John 1.1 have any merit? PS: The onward exchange here, where an objector tried to co-opt the authority of a math answers site to the cause of Bible objections, is an apt further illustration of the problem. Sadly, the way the exchange developed is all too familiar. While we know about the Babylonian (25/8) and the Egyptian (256/81) approximations as they wrote about it and used it in calculations, is their any instance where the “Solomonic” approximation (333/106) is used – before this ratio was (re? )discovered by Adrian Athonisz in the 16th century? always learning but never able to acknowledge the truth. DiEb don’t you ever get tired of living in flatland? DiEb, and of what possible use would it be for me if I searched around and maybe found an instance of pi being used at the time of Solomon for you to examine? I have no problems with interpreting the value of π in 1 Kings 7,23 as rounding to then next integer, or taking into account that there was a brim to the vessel. I have a problem with finding secret subtexts which allow for finding approximative values of π – but only if you know the real value beforehand. BTW, the method (and the value) to find 333/106 seems to be at least slightly less preposterous than the way 3.1416*10^16 was found…. I posted an uncompleted comment at first, sorry. But don’t you have a problem that an approximation of π is encoded into Genesis which was obsolete centuries before it could have been spotted? And for your other prophecies: They are less than impressive, as they all were found after the events took place – or hint to events in the far future. None of them is an example of a tested hypothesis, i.e., detected before the event, and then corroborated by the event happening at the promised time in the promised way.